As much as I want to shield my daughter from carbonated drinks that do no good to her health, the inevitable always happens. Of course, when she sees us sips from a glass full of ice and Coke, she'd think she can, too. So yeah, I usually let her. My mothering style is basically democratic. But please don't think I'm raising a brat here, I minimize my softdrinks intake so she won't take at all. We love water. Water is THE only thing that really quenches my thirst. But there are times I look for variety --- iced tea, flavored drink, fruit shakes and juices. I have tried a lot already, especially when I see something new in a convenience store near us. 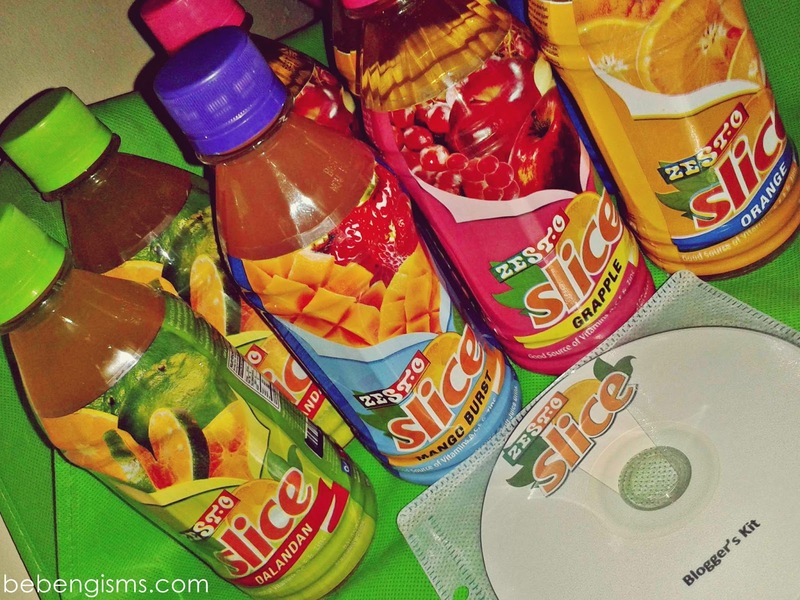 My latest discovery, which I am very grateful to have received samples of, was Zest-O Slice. It was delivered to our house one humid day. My thrilled girl instantly grabbed one and she chose the pink bottle --- the Grapple. 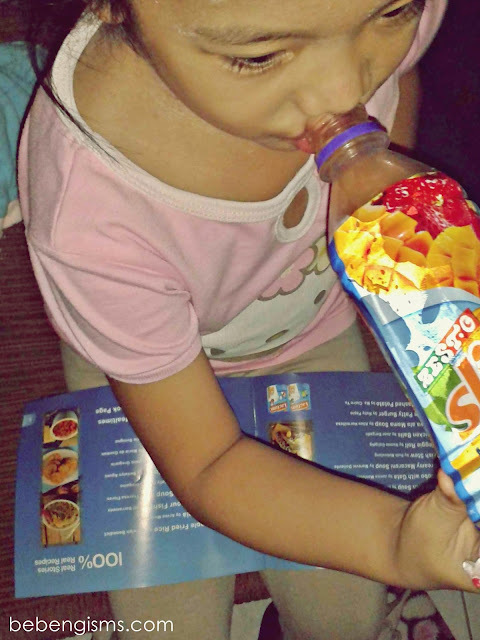 After a long gulp straight from the bottle, I heard a "mmmm, it's deleeeshaus, Nanay!" Below is the official product information from Zest-O. 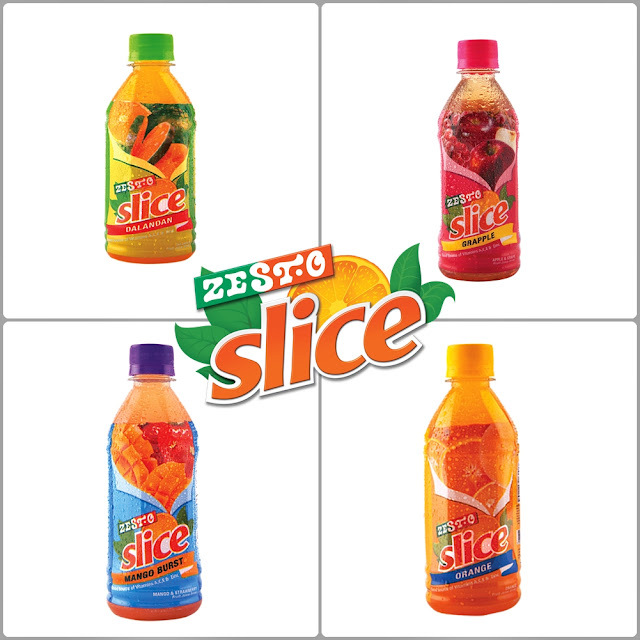 "Zest-O is proud to announce its newest product namely Zest-O SLICE fruit juice drinks. Zest-O SLICE is a fruit juice drink that brings all the goodness of your yesteryear into a delightful beverage that fits your modern lifestyle. Zest-O SLICE comes in 355ml bottle, that is just the right amount to quench your thirst and isn’t heavy on the pocket. It comes in four flavors. 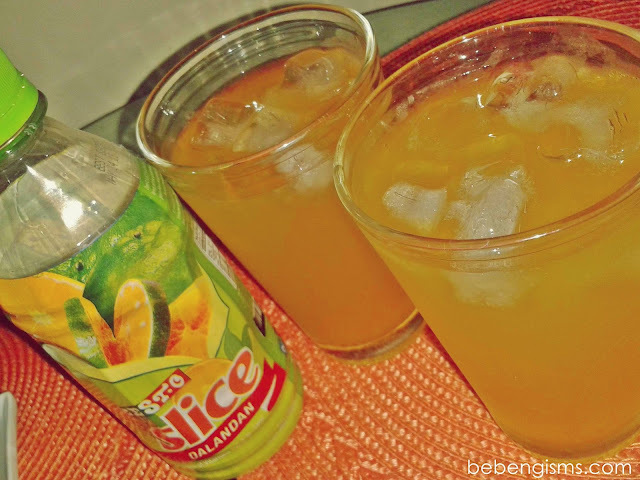 The first two flavors are straight fruit flavors that is a sure hit to Filipino consumers, Orange and Dalandan flavors has been formulated basing on the 30 years of experience of Zest-O in providing quality fruit juices. The last two flavors are our mixed fruit flavors, playful and exciting new taste, Grapple is a combination of Grapes and Apple, light and refreshing. Mango Bursts is a combination of Mango and strawberry, delighting the taste palates of choosy consumers. Zest-O SLICE is a good source of Vitamin A, C, E and Zinc that that help boost your immune system." Among the four flavors, not because of its bottle color, Grapple is my favorite, next is Dalandan. The later kind of tastes like apple cider but with a more wholesome kick. I will definitely look for this in supermarkets and/or convenience stores whenever we're traveling or simply looking for that real fruity taste in a drink. Try one when you see one. Disclosure: I received these items in exchange of an honest review. I was not paid to write about this product.